All testbeds in Fed4FIRE+ are available through an AM API. Within Fed4FIRE+ a GUI and CLI called jFed was developed for easy provisioning of resources and topologies. On this page we will show you how to install and configure jFed for the first time. omni is a command line tool for talking to SFA enabled testbeds. Go to the jFed download page and follow the instructions. ..note:: You may need to install additional software, please follow the instructions on the download page. jFed will open a browser to the Fed4FIRE+ Authority website. After logging in, it will automatically retrieve your login certificate. After downloading this certicate, jFed will ask for your password again to decrypt it for local use. 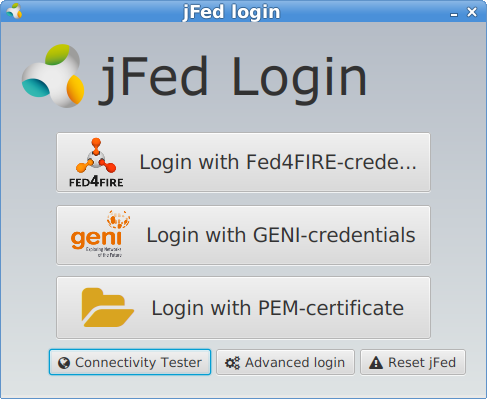 After you login for the first time, a dialog box will pop up to say that you have to configure jFed for this initial run. You do typically do not need to make any changes, but it might be good to check out some settings. In this preferences settings you should point jFed to the PuTTY installation directory (see Windows platform: PuTTY). You should see all green checkmarks. If not, then please download and install PuTTY. Click on Use pageant to manage SSH keys to enable the PuTTY SSH agent which makes that you only have to type the passphrase on your SSH key once. Click Save at the bottom right to save these settings. In this preferences settings, jFed should have a reasonable terminal configuration, so only change the default if it doesn’t work when logging in.